Teaching your kids to ski or snowboard gives them an active pursuit they'll enjoy for the rest of their lives. 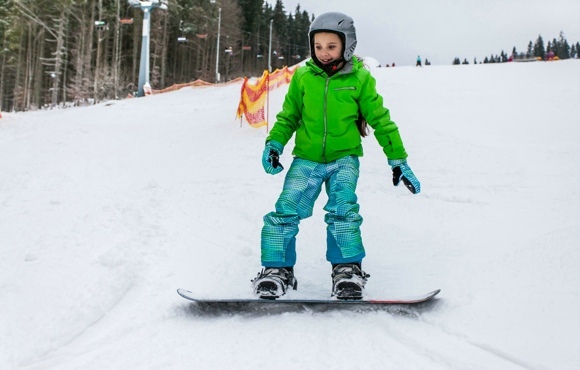 Not only are these popular winter sports fun, they can help kids stay fit, build important skills and expand travel horizons as well. But introducing little ones to the slopes can be intimidating–especially if you're still at the beginning or intermediate stage yourself. 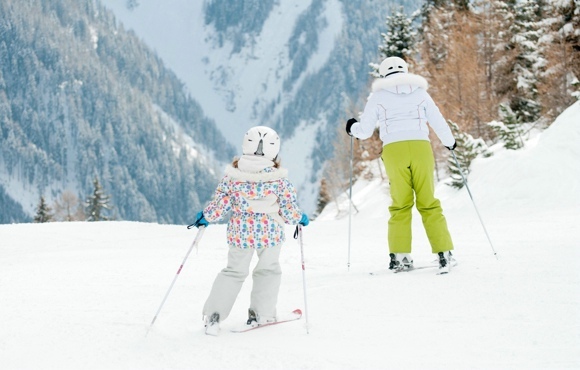 We spoke to skiing and snowboarding experts to find out what you need to know to help your child advance from novice to snow bunny in no time. Kids Ski Tip No. 1: Make it fun. "First, make sure your kids want to be out there," says Aurora Kushner, a certified Level III Adaptive and Level II Alpine instructor by the Professional Ski Instructors of America with over 20 years of experience. She recommends first choosing skis that are the right size--they should come up to the child's chin when standing on end–then allow kids to "play" with their ski gear before they strap in for a lesson. "Let them walk around with one ski on and one ski off, for example. This teaches balance and is so much a part of the foundation of the sport," Kushner says. Staying in the fun zone is also a way to keep it light and pressure-free for young kids. "Bring bean bags or little flags or cones that kids can ski around," she suggests. "Parents will be surprised about what kids can do." Kids Ski Tip No. 2: Don't let fear overpower the fun. "Don't let your fears become your kid's fears," says Kushner. 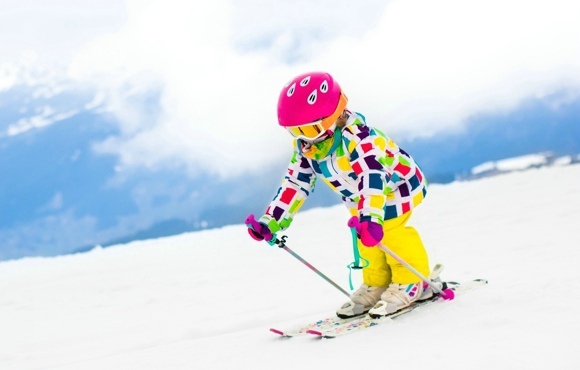 Children are intuitive learners, and most of them will dive right into the experience of skiing or snowboarding. As adults, our heads might cycle through everything that could go wrong, including visions of broken bones, but it's important not to let our fears affect our child's experience. Kids Ski Tip No. 3: Every kid is different. "Let the child's energy level determine how much to do in a day on the slopes," says Kushner. She also advises parents to be aware of their child's physical limitations. "A kid who is three to six years old has a higher center of mass," she explains. "They may not be able to move their arms and legs independently. At that age, it's really about getting balance, mimicking and doing some basic playing." "As kids get older they develop strength, particularly core strength, and gain increased coordination," she continues. 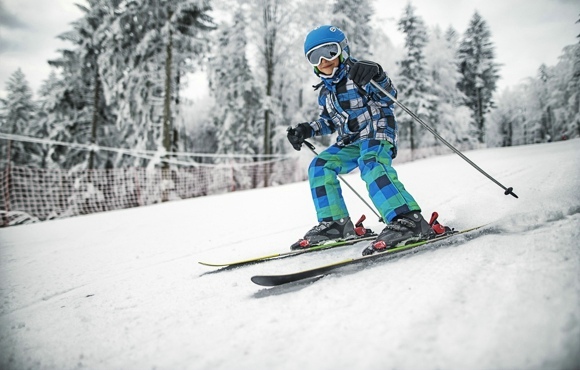 "After age six to eight, kids can focus on skiing with rhythm, playing with a little or a lot of edge and using both feet in skiing. Also, as their center of mass changes, they are learning balance and an effective stance. Games and obstacles that highlight balance, moving bilaterally or two-footed, and moving around cones are helpful." Kids Ski Tip No. 4: Stay flexible. Kushner also advises taking a cue from our kids about their personal preferences on the snow. 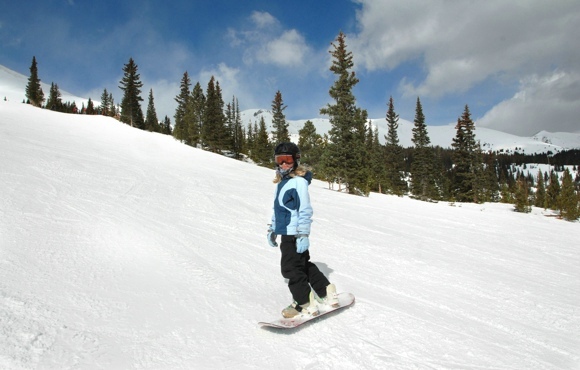 Don't force your child to ski if they indicate they want to try snowboarding–and vice versa. "Try different things and see what your kid picks up," she says. "I've seen some kids go out there and pick up skiing with no problem, but for some kids, snowboarding is easier. It's really about preference and what they enjoy doing." Kids Snowboard Tip No. 1: Gear makes all the difference. "It doesn't matter if you're having a good time on the snowboard or not. 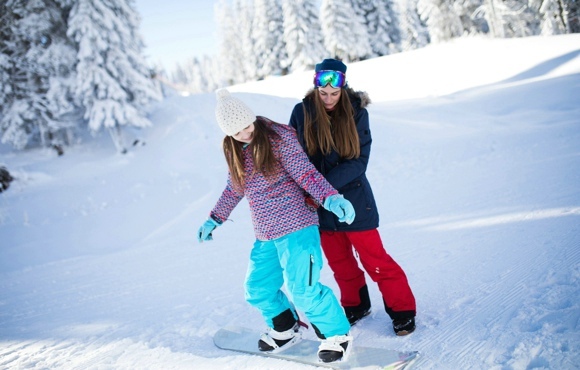 If you're freezing cold or wet, or if you have pain points in your feet or legs because your board is too big, you're going to be miserable," says Ryan Naylor, a Level 1 certified snowboarding instructor with the American Association of Snowboard Instructors. 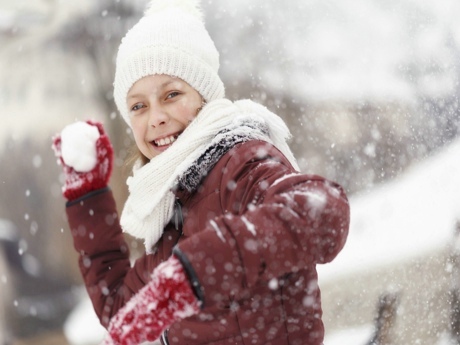 Before your child even touches snow, it's important they have gear and equipment that fits them. Your child's snowboard, when propped on the ground, should come up to their chin or nose, says Naylor. Also, make sure their boots and bindings are the right size, and ensure their clothes are warm and can stay dry throughout the day. Kids Snowboard Tip No. 2: Start on flat ground. "The biggest part of snowboarding is learning how to use your edges," says Naylor. "That's the foundation of snowboarding." 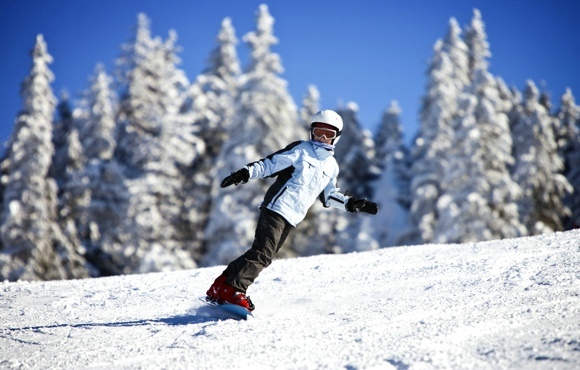 Encourage your child to use their toe and heel to carve the snowboard into flat snow. Have them snap their dominant foot into the binding and use the other foot to push themselves along. "The foot that is strapped in is telling your snowboard what to do," says Naylor, "See if the child can get their balance, bend at the knees and look over their shoulder towards their dominant foot." A simple trick for discovering your dominant foot is to stand with both feet together and have someone gently push you when you aren't expecting it. The foot you step forward to catch yourself with is your dominant foot. Don't try this on slippery snow or ice! Kids Snowboard Tip No. 3: Stick with it. Once your child is comfortable in their gear and has practiced on flat ground, it's time to sign up for a lesson and start practicing. Naylor advises to set appropriate expectations at this point. "It takes a minute to get the hang of snowboarding," he says. "Don't let impatience detract from the experience. Keep with it." Kids Snowboard Tip No. 4: Know their limits. 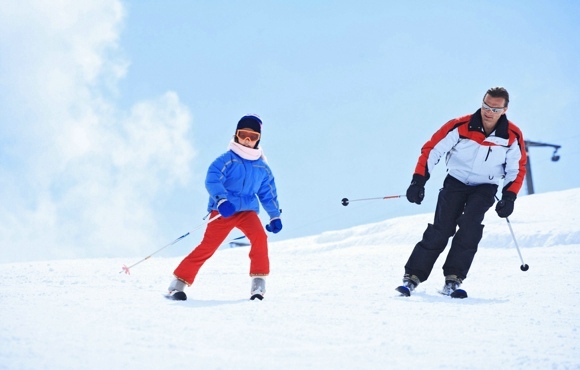 Finally, when your child is old enough to hit the slopes with friends, make sure they know their limits and won't be pressured to try runs they aren't comfortable with. "That's a really good way to get injured or to scare someone badly enough that they won't want to snowboard again," says Naylor.